We’d love your help. Let us know what’s wrong with this preview of Gathering Blue by Lois Lowry. Lois Lowry once again creates a mysterious but plausible future world. It is a society ruled by savagery and deceit that shuns and discards the weak. Left orphaned and physically flawed, young Kira faces a frightening, uncertain future. Blessed with an almost magical talent that keeps her alive, she struggles with ever broadening responsibilities in her quest for truth, di Lois Lowry once again creates a mysterious but plausible future world. It is a society ruled by savagery and deceit that shuns and discards the weak. Left orphaned and physically flawed, young Kira faces a frightening, uncertain future. Blessed with an almost magical talent that keeps her alive, she struggles with ever broadening responsibilities in her quest for truth, discovering things that will change her life forever. To ask other readers questions about Gathering Blue, please sign up. is this book a sequel to the giver? or is it it's own separate world? Do i need to read the Giver before this book? Bethany Yes you should, and you need to read Son last. You don't have to, but everything will make more sense. That's not a plot, that's a twist! I read this book as a companion to "The Giver," and I was pretty disappointed. The underlying sense of unease and the tense pacing that makes the Giver so fantastic just isn't present in "Gathering Blue." Part of this, is that because it is a companion book, I read this book differently than I read the Giver. Instead of reading the book with white knuckles and wide eyes, thinking, "What the heck is wrong with these people???" I read it thinking, "Yeah, yeah, cre That's not a plot, that's a twist! Part of this, is that because it is a companion book, I read this book differently than I read the Giver. Instead of reading the book with white knuckles and wide eyes, thinking, "What the heck is wrong with these people???" I read it thinking, "Yeah, yeah, creepy village -- what's the twist?" I think the book might actually be better read if you haven't read "The Giver." However, I'm hesitant to say that, because if you're going to read one dystopic Lowry novel, you should definitely go for The Giver. Because the main character is an outcast and the reader is therefore also kept at arm's length from the village, the reader doesn't feel a strong sense of betrayal or shock when the inevitable twist occurs. We're not connected with the village, in the way that we were connected to Jonas's community through his ties for his parents and friends. Furthermore, the world is not incredibly well-crafted (Do we really need the beasts? Another device might have been even more menacing), to the point of being uninspired. Kira is also very passive and it was hard for me to connect with her. Things happen to Kira -- she doesn't make things happen, which doesn't make for a gripping read. I wish the story had been told from the point of view of her adventurous young friend Matt, the only character in the novel who is dynamic enough to act. Also, the pacing is horribly slow. I don't think I would have had the patience for this novel as a young reader. As a sequel - horribly disappointing. As a standalone - mildly interesting. Honestly, I was expecting a lot more...like the characters from book 1 to show up in book 2. I mean, there's a hint (and it's barely a hint) so I guess, it might be able to be classified as a companion novel. We follow Kira, a young teen with an almost magical artistic gift. She is forever hindered by a birth defect, causing lameness in one leg. Her society is cruel, stupid and evil. Women are little more than breeding stock and homemakers - A far cry from the orderly yet emotionless one we saw in the first book. Kira's fate would've been to marry and breed... well, until the village realized her flaw (to paraphrase - no one wants a crippled wife). Unsurprisingly, her society also suppresses all forms of educations (especially for women). But it made her smile, to see it, to see how the pen formed the shapes and the shapes told a story of a name. Kira is on the cusp of losing her home and everything she's ever known. When she performed a vigil over her mother's body...the village women hatch a plan toseize newly orphaned Kira's land and build a pen for the toddlers. Kira is lame, so really...she should've been given back to the forest (aka left to die) years ago. Just before they can carry out their plans, the council of elders swoo in to save her. Kira suddenly finds herself in a brand new world. One with plumbing, and beds, and with all the embroidery string she could want. The council (conveniently) needs a new artist to repair the singer's robe and were willing to take Kira in when she was desperate. This book was a bit frustrating. It didn't have the same magic as book 1 and my interpretation is colored by my bitterness - how is this even considered a book 2?? Maybe because I'm older this time, but it's so. painfully. obvious. when Kira gets manipulated or the reasons behind a unexpected death. It just frustrates me so much when the main characters are so darn oblivious. Extremely well read - a pleasure to listen to. Hats off to the narrator - Katherine Borowitz. Alright kids, settle down! It's time for our lesson of the day. Today we will be focusing on Gathering Blue by Lois Lowry, which is her follow-up to The Giver, a popular modern classic that I know many of you loved. But first let's clear the room of any adults disguised as kids. You know who you are! You read books written for children and young adults that are intended to be modern day parables, stripped of details and complicated, "realistic" characters, stories that are intended to be less abo Alright kids, settle down! It's time for our lesson of the day. Today we will be focusing on Gathering Blue by Lois Lowry, which is her follow-up to The Giver, a popular modern classic that I know many of you loved. But first let's clear the room of any adults disguised as kids. You know who you are! You read books written for children and young adults that are intended to be modern day parables, stripped of details and complicated, "realistic" characters, stories that are intended to be less about the world being built and more about the theme being developed, and you dismiss them as trite, two-dimensional, and predictable. Get out of here! Also - and I'm sorry for any hurt feelings at this announcement - I'd like to ask that any of the less imaginative among us to maybe take a walk or a nap. If you can't conceive of a second book in a series having more of a thematic rather than a literal connection to its predecessor, if the very idea of a "thematic connection" makes you annoyed... then discussion of today's lesson is not for you! Sorry, and enjoy your break. Okay, now that our group is a little smaller, maybe feels a little safer, let's dive in. Gathering Blue is set in a harsh world filled with even harsher adults. It's very different from The Giver, albeit with some key similarities: both are set in places that suffer from a lack of empathy and kindness; both stories recognize that pain is necessary to existence, connection to others creates meaning, and your imagination will set you free. The fascinating thing to consider is that these important ideas about the necessity of certain feelings and bonds and the power of imagination are conveyed in two completely different settings within tales that remain strikingly similar in their thematic intentions. Just as an artist will continually revisit the same themes and ideas, an important lesson will be retold in multiple ways - and still retain its value. The world of The Giver was creepily placid; the world of Gathering Blue is starkly brutal. The importance of the lesson remains the same despite the change in the story surrounding it; and yet it is that change in the story, in its setting and characters, that keeps the lesson fresh. Wow, what a well written little story. Little in the sense it isn't long but there is a wonderful sense of economy with her writing, no, or very little, extraneous material. No outside characters that clog up the narrative. I did see one of the plot twist coming and wondered why the author took her sweet time about revealing it to the main character even though as I reader, I saw it coming. Seems to be my trend lately, I keep seeing when writers throw in their version of the "McGuffin" or whatever Hitchcock called it. Which isn't a bad thing, just try not to make it so obvious next time. I'm not sure if the reader should be smarter than the main character. It's like in films when the audience knows something it takes the character on the screen half the movie to figure out. Not good. At any rate, I love the characters and mostly loved the style of writing. It was told simply and elegantly.The introduction of the world inhabited by the characters was top-notch. As I predicted, I was sorry to see the book end but was very happy with the resolution of the story. It made sense to me, which I can't say about a lot of books. When I returned the book to my local library, I went looking for the prequel (The Giver) only to come away empty handed. It is a very popular book! But, then to my surprise, I found "Gathering Blue" had a sequel. I'd love to say I'll be diving in this right away but I have a whole stack of books that need to get read. Plus, I'd like some time to ruminate over this generally well told story. Not much happens, but it is still a very fascinating read. Gathering Blue is a young adult social science novel, written by Lois Lowry and released in the year 2000. It is a companion book to The Giver (1993) being set in the same future time period and universe, treating some of the same themes, and is followed by Messenger (2004), and Son (2012) in The Giver Quartet. The central character, Kira, who has a deformed leg, is orphaned and must learn to survive in a society that normally leaves the weak or disabled exposed to die in the fields. In the course of the book, she begins to learn the art of dyeing thread different colors, except for blue, which nobody in her community knows how to make. She also learns more about the truth of her village and the terrible secrets they hold. This review has been hidden because it contains spoilers. To view it, click here. I had this book mapped out in my mind. From where The Giver left off, I was sure book #2 would begin with Jonas and Gabriel surviving and finding the mainstream community, like that of our modern civilization... with music, color, and love, and then they live happily ever after. But book #2 wasn't concerned about telling Jonas's life story or a respite to what might face humankind in the future. Lowry was continuing to explore the world of a post-apocalyptic society. In this book, she has create I had this book mapped out in my mind. From where The Giver left off, I was sure book #2 would begin with Jonas and Gabriel surviving and finding the mainstream community, like that of our modern civilization... with music, color, and love, and then they live happily ever after. But book #2 wasn't concerned about telling Jonas's life story or a respite to what might face humankind in the future. Lowry was continuing to explore the world of a post-apocalyptic society. In this book, she has created a Village that is hostile to young children, ranks a person by how many syllables are in their name, and casts out damaged individuals to the Forest. Set years after The Giver, we are introduced to Kira in this book. We learn that before she was born, her father went to hunt and was said to have been taken by the 'beast'. She was born crippled (twisted leg) and according to law she should have been cast out, but her mother Katrina did not let that happen. Then upon Katrina's strange death (the start of the book), Kira found herself orphaned and faced the mercy of The Council of Guardians to determine her fate. Fortunately, she was an 'artist' that they needed so they allowed her to stay and she becomes the seamstress to handle the coveted Singer's robe. She befriends another 'artist', Thomas the Carver. Also maintains her previous friendship with Matt, a spirited young 'tyke'. Then she learns from Isabella Annabella, a dye-colorist expert, that there are no beasts in the Forest. That and upon discovering the mysterious captivity of Jo, another 'artist' (a young girl that beautifully sings), Kari begins to wonder what is going on. In the meantime, Matt's eccentric character leads him into the Forest where he discovers Christopher (Kira's father). Before she knew it, Kari was going to get the puzzle pieces together. The ending of course was another thought provoking cliffhanger! The seed of hope may or may not flourish. Once I understood where Lowry was going with this book, I liked the plot. However, I didn't find the characters as gripping as in the first book ... with exception of Matt, so I'm glad to see that he will have a major role in the third book. I am curious to see how Lowry ends up tying it all together. "Take pride in your pain, ...You are stronger than those who have none." Kira is a young girl who was born with a twisted leg, causing her to limp and need a walking stick. She is considered weak and useless by most of the people in her village, but her mother refused to leave her out in the field for the beasts to get like everyone else did with “damaged” babies and those who broke the rules too many times. This story has nothing to do with The Giver, but it could be another community in the same world far, far away. While The Giver was a utopian/dystopian background Kira is a young girl who was born with a twisted leg, causing her to limp and need a walking stick. She is considered weak and useless by most of the people in her village, but her mother refused to leave her out in the field for the beasts to get like everyone else did with “damaged” babies and those who broke the rules too many times. This story has nothing to do with The Giver, but it could be another community in the same world far, far away. While The Giver was a utopian/dystopian background with technology and medicine, this world has no technology at all. Herbal medicine is about all they have. They can build shelters from wood, the men hunt, women aren’t allowed to learn to read or write. They have gardens and are hunter/gatherers. It’s a harsh world. Most are dirt poor. Small children are beaten and treated like animals, and if you get hurt too badly, you'll lose your work and home and your kids will get taken away. The draggers will take you away to the field for the beasts to get. *Stuff happens* and Kira is taken to live with the guardian council, all men, who make the big decisions and govern over the community. Kira becomes a seamstress, a sewer, and begins work on the beautiful coat the singer wears each year at The Gathering. The coat is embroidered with the people's past...everything that has happened from the beginning of the world to the destruction of the world before, and up to the present. Slowly, Kira begins to see the cracks in her world, the flaws, the unfairness, the lack of freedom she and everyone else has. It's a sort of slow-moving book and not a whole lot happens, so I'm glad I decided to listen to the audio version. To be honest, I don’t think I would have been interested in the print version. Listening to it was nice. Plus, it’s a rather short book. I liked Kira. I hated the world she lived in, but it was interesting to learn about it. The ending was a bit vague and open-ended, but so was The Giver. This one has more of an ending than that one did. Overall, probably closer to 3.5 stars. It’s nowhere near as good as The Giver and completely different. I probably wouldn't read it again, but I did enjoy it! athering Blue is a companion novel to The Giver. This is a gentle warning that you won’t get any sort of resolution from The Giver with this book. Despite that little niggle, I actually really enjoyed Gathering Blue. I loved following Kira’s story as she faced an uncertain future. I really enjoy Lois Lowry’s writing style. I love how her books are frustrating, but so bloomin’ wonderful at the same time. The world which she imagines is rather terrifying. Gathering Blue follows Kira, as she grieves athering Blue is a companion novel to The Giver. This is a gentle warning that you won’t get any sort of resolution from The Giver with this book. Despite that little niggle, I actually really enjoyed Gathering Blue. I loved following Kira’s story as she faced an uncertain future. I really enjoy Lois Lowry’s writing style. I love how her books are frustrating, but so bloomin’ wonderful at the same time. The world which she imagines is rather terrifying. Reading this book reminded me a lot of M. Night Shyamalan's The Village (which a lot of people hated but is my favorite movie of his that I've seen!) --a village that seems just too good to be true, with a suspicious group of leaders and a question as to whether there really are monsters in the woods that are dangerous to the inhabitants. I found it best to go into this without expectations, since I loved The Giver and knew this was supposed to be a companion novel to it, I didn't want to let my l Reading this book reminded me a lot of M. Night Shyamalan's The Village (which a lot of people hated but is my favorite movie of his that I've seen!) --a village that seems just too good to be true, with a suspicious group of leaders and a question as to whether there really are monsters in the woods that are dangerous to the inhabitants. I found it best to go into this without expectations, since I loved The Giver and knew this was supposed to be a companion novel to it, I didn't want to let my love for the previous novel make this experience less enjoyable. A lot of readers seem to have had that problem--they expect this to be some kind of sequel or the same story, whereas it's a companion in the sense that it shares a lot of the same themes from The Giver and it seems to be the same post-apocalyptic world where different societies have cropped up around the world and adjust to the new situations differently. At the age of 63, I've read "The Giver" and have now read "Gathering Blue." I continue to be impressed. I like authors who take simple elements and make a complex story out of them. There's no rich historical tapestry nor complicated interplay of personalities. This is a story that adults can appreciate, and I wonder what it would have been like to read this story when I was 12 years old. (Of course, when I was 12 years old, this story hadn't been written). Once again, it is set in a society whic At the age of 63, I've read "The Giver" and have now read "Gathering Blue." I continue to be impressed. I like authors who take simple elements and make a complex story out of them. There's no rich historical tapestry nor complicated interplay of personalities. This is a story that adults can appreciate, and I wonder what it would have been like to read this story when I was 12 years old. (Of course, when I was 12 years old, this story hadn't been written). Once again, it is set in a society which is simpler than ours (or at least, not as technologically advanced). It is a society harsher than ours, though not entirely without feeling -- so this is not a leaden-handed "dystopia." In fact, in many ways it feels like our own society. If you've read "The Giver," the ending of "Gathering Blue" represents an interesting contrast. If you read this book without reading "The Giver," the genre would be unclear at first. Is this science fiction, fantasy, or just a drama set in the future -- or in the past, or on a different planet entirely? In "Gathering Blue" it becomes clear for the first time that this is a drama set in the future, and is set on the planet Earth that we know. It is not a Middle-Earth like land created ex nihilo. This is evident from the "poetry" at the bottom of p. 171, "Ravaged all, Bogo tabal, Timore toron, Totoo now gone." But there are also fantasy elements, just as in "The Giver," in this case a piece of cloth that clearly conveys danger, or reassurance. Or is even this reading too much into the plot? I appreciate this kind of ambiguity in a story. 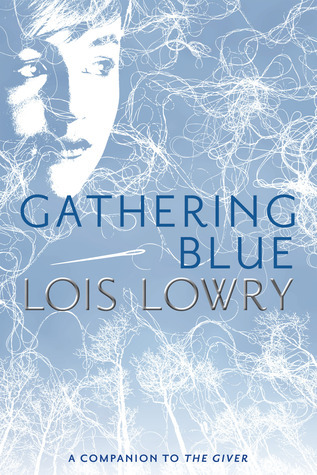 Gathering Blue is an unlikely sequel to The Giver, Lois Lowry's famous dystopia. It's unlikely because it has literally nothing to do with its predecessor, and I'm not sure why it was even written. Like The Giver, Gathering Blue is also a dystopian novel andalthough you might find it difficult to believe the dystopian world in the novel is even less developed than the one in The Giver. Basically, the story is set in a village at some unspecific point in time, where people who cannot work and cont Gathering Blue is an unlikely sequel to The Giver, Lois Lowry's famous dystopia. It's unlikely because it has literally nothing to do with its predecessor, and I'm not sure why it was even written. Like The Giver, Gathering Blue is also a dystopian novel andalthough you might find it difficult to believe the dystopian world in the novel is even less developed than the one in The Giver. Basically, the story is set in a village at some unspecific point in time, where people who cannot work and contribute to society are killed. The main character, Kira, is handicapped (a twisted leg), and was protected from being killed by her mother, who has just died. The Village Council decides to allow Kira to remain within the village as she is a skilled weaver, and gives her a important task - repairing illustrations embroidered on a robe which shows the history of the society, worn by a Singer who performs at a day-long Ruin Song Gathering, singing about the past. Perhaps the fatal flaw of Gathering Blue is the lack of details, even more so than in The Giver - we do not connect with Kira's village because we know so little about it - the political and societal structure of he village is barely drawn, and is even more unimaginative than the one in The Giver. The plot feels contrived to the point of being absurd - the significance of the paintings which Kira repairs is never fully explained - and, like The Giver, the book ends with a cliffhanger - with a twist that would make M. Night Shyamalan cringe. But to get to that point you'll have to get through an unimaginative book which moves at a glacial pace, with events that we don't care about and people we don't care for - I can't possibly see how it could attract the attention of younger readers, let alone keep it. This review has been hidden because it contains spoilers. To view it, click here. Going into this book knowing that it is the companion to The Giver did not do me any favors. The problem is that The Giver is so darn good that any "companion" would not live up to it. This is what happened. One problem is that there isn't a whole lot going on. Kira leads us through a ton of information about weaving/sewing, threads, dyes, plants, etc. I really expected something bigger to come out of this. Some sort of explanation for her being. Nope. None. You do get the feeling that a lot more Going into this book knowing that it is the companion to The Giver did not do me any favors. The problem is that The Giver is so darn good that any "companion" would not live up to it. This is what happened. One problem is that there isn't a whole lot going on. Kira leads us through a ton of information about weaving/sewing, threads, dyes, plants, etc. I really expected something bigger to come out of this. Some sort of explanation for her being. Nope. None. You do get the feeling that a lot more is going on (i.e. with the Council) than Kira knows about, but we never really learn about that either. This book was predictable. Part of this might have come from the links between M. Night Shyamalan's The Village and this book. Because of this, we already had a feeling that the Council had a dirty secret, that there were no beasts, and that there were other, better communities out there. I read someone else's review that made a good point: in The Giver, we are connected to the community because Jonas is. Because we are invested in how great it is, we feel real disquiet and betrayal at the truths behind the community. Since Kira is an outcast and has always been treated poorly, we don't really feel any pain at the loss of what we thought was home. This was something Lowrey did wonderfully in The Giver and didn't manage in Gathering Blue. Boring and predictable and trite and not at all what I was expecting. I thought it was a continuation of The Giver but it isn't. I thought it would be in the same world as The Giver but I can't see any similarities. I thought it would be science fiction but there is nothing along the lines of The Giver in that department. This might be a great read for a young adult who hasn't read the giver or doesn't know it's part of that "series" but I didn't enjoy it at all and couldn't finish it. For those Boring and predictable and trite and not at all what I was expecting. I thought it was a continuation of The Giver but it isn't. I thought it would be in the same world as The Giver but I can't see any similarities. I thought it would be science fiction but there is nothing along the lines of The Giver in that department. This review has been hidden because it contains spoilers. To view it, click here. The problem with this book is it doesn't seem like it's the same world as The Giver. The Giver world was full of technology that blocked out WEATHER and they genetically altered people. They had pills that suppressed feelings and passion. There were no mammals and birds allowed! But the world in this book is gritty and dirty. Parents smack their kids. Men hunt with spears. Women can't read, it's sexist and horrible. Everyone has to punch each other and beat each other up for the slightest thing. T The problem with this book is it doesn't seem like it's the same world as The Giver. But the world in this book is gritty and dirty. Parents smack their kids. Men hunt with spears. Women can't read, it's sexist and horrible. Everyone has to punch each other and beat each other up for the slightest thing. They live in mud huts and put children in chicken pens. the only nice building is the one Kira lives in after her mother dies and she becomes an orphan with no father but a lot of talent. Despite the fact that her world is dirty and gritty, the stakes just aren't as high for her as they are for Jonas. She lives in a cushy place with hot water where Jonas was running away from a place of comfort to the unknown. I don't see how she and Thomas are going to change things, but at least they're safe? Also, I really don't find it believable that Jonas and her marry in the 4th book. Marrying Thomas makes a bit more sense. Also the syllable thing DOES NOT MAKE SENSE. Some names don't need four syllables. Really, the Giver is better than this book. This started out okay, but I lost interest as it went on. I felt quite sorry for Kira and the way she was treated in this book, the people of this village were seriously harsh, and really didn’t give anybody a chance if they had any kind of disability or impairment! The storyline was about Kira being at risk of being thrown out of the village where she lived after her mother died, and her life thereafter. There were a lot of plot-points that were entirely too obvious and the slow pace in the secon This started out okay, but I lost interest as it went on. The storyline was about Kira being at risk of being thrown out of the village where she lived after her mother died, and her life thereafter. There were a lot of plot-points that were entirely too obvious and the slow pace in the second half killed this book for me. The ending was okay, although it was clear that the story would be continued. A quick read, that is a little confusing as it didn't seem to relate to the first book in the series. Kira has just lost her mother and the only thing standing between her and the cruel women of the village. She is crippled, and in their eyes she is just another mouth to feed. One that contributes nothing. But she does have one skill, one that may save her life. This world is very different from the one I entered with the first book in the series. People are dirty. They fight for food, keep their A quick read, that is a little confusing as it didn't seem to relate to the first book in the series. This world is very different from the one I entered with the first book in the series. People are dirty. They fight for food, keep their toddlers in pens with the fowl and live in huts. It was not what I was expecting at all. The treatment of kids in this book was sad for me. People in the town were selfish, and got what they wanted even at the expense of their children. The slapping and kicking was also shocking to me. While Gathering Blue is the second book in The Giver Quartet, it is not a sequel to The Giver. There are similarities, though. Both stories explore themes of physical and emotional pain, individual worth, communal memory, and the role of the governing body of a community -- all, amazingly through the eyes and experiences of children. I really love the main characters, Kira, Thomas, Matt, and Jo. (I even feel fond of Matt's resilient dog, Branch.) In the midst of the violence and anxiety of their While Gathering Blue is the second book in The Giver Quartet, it is not a sequel to The Giver. There are similarities, though. Both stories explore themes of physical and emotional pain, individual worth, communal memory, and the role of the governing body of a community -- all, amazingly through the eyes and experiences of children. I really love the main characters, Kira, Thomas, Matt, and Jo. (I even feel fond of Matt's resilient dog, Branch.) In the midst of the violence and anxiety of their dystopian village, the children remain incredibly calm and reliable; intelligent and thoughtful; gentle, sensitive, and loving. They seem too "perfect" to be real children but nonetheless each day I looked forward to escaping to their world and hearing of their adventures. I was deeply moved by the vivid descriptions of surroundings and events, both beautiful and horrible, apparently a trademark of author Lois Lowry. Like The Giver, Gathering Blue has strong spiritual overtones. I was astounded by the symbolism which is woven into the story, much as Kira weaves her colourful threads into the fabric of the community's sacred robe. Kira is a girl with a challenge and a gift, and throughout the story there is a sense of divine presence and purpose in her life. Although this book has been on my virtual "to-read" shelf ever since I read The Giver a couple of years ago, I am glad that I did not rush to read it sooner. It has come to me following a long fallow time, a trudge through a spiritual wilderness, like blue sky after a storm or cool water on a hot day. Its loving tones, its rich symbolism, and its hope for the future in Kira's world have begun to revitalize me and once again, as often happens during the time of Epiphany, when the days have begun to lengthen, I feel confident that the Inner Light will also return. Gathering Blue is the second installment in author Lois Lowry's The Giver Quartet. I was pretty confused going into this book as I just assumed the story would be picking back up at the point where The Giver ended. But Gathering Blue is a different story with different characters. Dystopian? Yes. But it features a much calmer world than what I've become accustomed in the dystopian genre. It's not bad at all, just different. This story taught me that dreams of darkened alternate futures don't alw Gathering Blue is the second installment in author Lois Lowry's The Giver Quartet. I was pretty confused going into this book as I just assumed the story would be picking back up at the point where The Giver ended. But Gathering Blue is a different story with different characters. Dystopian? Yes. But it features a much calmer world than what I've become accustomed in the dystopian genre. It's not bad at all, just different. This story taught me that dreams of darkened alternate futures don't always have to be filled with dehumanizing technological advancements, man-made disasters, or class-based revolutions... they can be filled with passivity and the accepted discard of the weak, which in the end is just as terrifying. Considering how much I loved the first book, I don’t really know how to feel about this one. The whole concept and idea was very interesting, the idea of an archaic society that at the same time is futuristic, where the people that are considered weak can’t be part of it. The thing that didn’t convince me was the plot itself. Kira is a girl with a “defect” for this type of society, but thanks to her talent in needlework, once her mother mysteriously dies because of a sickness, she is brought to work for the finest people of this society. There she meets Thomas and little Jo, who have too incredible talents. Throughout the book there are little peculiar things that got my attention, like that they can earn a longer name with time, that’s a cool thing to add. But plot speaking, it lost me a little from its middle till the end. Even if it’s very easy to follow, there are some parts that for me are still a mystery. The characters didn’t help to build the entire story, I found them interesting but with little personality. It was interesting, but didn't hold my attention much, especially compared to The Giver. To be completely honest, it felt like half a book, and the first half only. It was unresolved and, to use a pun in line with the subject matter, had several loose threads. Besides that, Kira was rather boring as a protagonist. Even when she learned horrible things about her world, she remained content to stay and be a part of the system. I loved Matt and Thomas though. LOIS LOWRY CONTINUES to create a unique world in her second volume of The Giver quartet. In Gathering Blue , she intricately weaves a society wrought with poverty, where savagery, greed, and deceit prevail, and the weak are mercilessly shunned and discarded. Kira, born physically flawed, is destined for abandonment in the Field of Leaving. By the fierce protection and love of her mother, she marginally escapes this heartless custom. When her mother unexpectedly falls ill, she finds herself orphaned and in danger of an envious woman named Veranda who seeks to steal her home and leave her to the “beasts.” Kira’s dangerous confrontation with Veranda brings her before the all-powerful Guardians – enforcers of their justice system. Seemingly kind, the Guardians remove her from her rundown home to live under their protection at the Council Edifice, where she is expected to use her skills to do their bidding. Separated from her home with only the mysterious Guardian Jamison for supervision, Kira's loneliness is abated when friendships blossom with the other artists in residence. Thomas, a young carver who works on the intricate symbols engraved on the Singer's staff, and Jo, a three-year girl with the voice of an angel being trained as the next Singer. Seria lui Lois Lowry ar trebui să fie studiată la şcoală. Simbolistica este cutremurătoare. Făuritoarea de albastru dezvoltă temele din Darul lui Jonas, le transpune într-o viziune asemănătoare, fără să le caute o explicație sau o rezolvare. Un stil fluid, o lectură rapidă şi personaje magice. Mi-a plăcut foarte mult şi abia aştept al 3-lea roman, care le va lega pe primele două. I really enjoyed this Book #2 of The Giver series. It has a little mystery, drama, and sweetness all put together in this one book. And it has enough of a secret at the end that it leaves the reader wanting to get to the next book (Messenger) to see what happens! Can't wait! I'm glad so many people warned me that Gathering Blue doesn't follow Jonas like The Giver did. It aloud me to fully enjoy this new story. Gathering Blue was atmospheric and moving just like The Giver, and while I did enjoy book 1 more, I still highly recommend this one too! I'm going to start off by saying that I read Gathering Blue a long time ago for school. I first read this book in 2013 for my Year 1 Literature class. I think I liked the book and had a pleasant experience reading it, but after that my memories are obscured by all the discussions of themes, characters, plot and setting that we had in class, and so I don't think I really appreciated the storyline of this novel, or the experience of just reading it without having to analyse it from a literary perspective. Kira is a girl with a twisted leg who lives in a world where the weak are cast aside. Her mother, Katrina, has always protected her and taught her to keep her head high, but after Katrina dies, Kira fears for her future as the village women want to cast her out. But Kira has a gift - one so rare that no other community member has it. Because of this, she is spared by the all-powerful Council of Guardians and given a new role in the village. Kira grows into her new life, but soon she realises that she is surrounded by a dark web of mysteries and secrets. No one must know of her plans to uncover the truth about her world - or what lies beyond it. When I read Gathering Blue for a second time I found it less interesting and even slow at times. Even though I'd forgotten the story, I saw the plot points coming from 8258 miles away. Foreshadowing in the book was really obvious and at times I was rolling my eyes at how Kira didn't get it sooner. Perhaps it is because this book is clearly in the middle-grade genre. However, the plot was interesting enough to keep me reading and by the end I was truly attached to all the characters. The ending clearly indicated that it wasn't the end of the story, but from what I've seen Kira is no longer the main character in the next two books, so probably some characters will be making cameos in the future books. Now for some of the good points! Lois Lowry's writing is spectacular. She draws you into her world with a few sweeping sentences, never minces her words, and is pretty good at descriptions. All contribute to a riveting story. The dystopian world was truly fascinating to read about, because I saw so many similarities and connections between today's humanity and the people in the story. And last but not least, the plot twist at the end, which I didn't see coming until a few pages before, shocked me to the core. Pain makes you strong. But pain can also make one cruel, or it can make one kind and understanding. There are two extremes featured in this novel - the people who cruelly cast out those who are weak, and the mysterious village of healing that accepts anyone who is broken in any way. "They help each other," her father explained simply. "We help each other. "Those who can see? They guide me. I am never without helping eyes. "Those who can't walk? They are carried." "There is always someone to lean on," he told her. "Or a pair of strong hands for those who have none." Self-interest, is, sadly, part of our lives today. Political leaders put their own goals ahead of the good of the people. Wealth amassed by a few, while the masses live in poverty... you can see that in many places. Subjugation of women, and brutality toward the weak: think of the Taliban regime in Afghanistan. Yet always there are those... like Kira... who emerge as potential leaders, with a gift for peace and a spirit of benevolence. Those are the people we must watch for and nurture and support. The blue that she holds in her hands at the end of the book is simply a symbol. The blue to be gathered can take many different forms in today's world. I thought this book sent two very vital messages. First, that it is up to us, the younger generation, to shape the future, and we must always stand behind those with the right values and who will do right by our country, instead of just thinking of our own benefits. Also, that we as a society should learn to be more inclusive and accepting of people who are different. Everyone is fighting a battle you know nothing about, and everyone has their own unique story to tell, to add to the collective history known as humanity. Be kind. I enjoyed this slightly more than The Giver (the first book in the series). Kira was a far more relatable protagonist than Jonas… However, she wasn't very endearing — she lacked depth and just wasn't very interesting — all there was to her was her niceness and her ability to let other people push her around, control her and use her. I would have preferred a heroine that was more in charge of herself and more aware of her surroundings. The world in Gathering Blue wasn't quite as fascinating as The Giver's. It was still fairly decent but it lacked imagination. The world building basically consisted of Kira living in village where everyone was mean and anyone that was seen as flawed, weak or reliant was rejected. Kira's world just didn't stand out enough for me — it was okay but I was expecting more after The Giver. They were a few aspects that I thought were quite good: 1. The villagers that were seen as defective were left to die in the 'field' 2. After her mother died, Kira had to defend her right to stay in her village 3. A syllable was added to each persons name as they grew older 4. The ceremony, song and robe revealing the history of the world 5. Kira's powers/weaving being used to shape the future. Matt was a really great character — he was charming, adventurous and loyal. I loved how much he helped Kira — their friendship was definitely the highlight of the book for me. The other characters were boring and forgettable. I was less than impressed with the evul, controlling council — it was just so predictable and cliched. I would have preferred if the council had a different motivation for their controlling ways - a genuine reason for wanting a certain future to be weaved rather than them just being selfish and greedy for power. Overall, it was a pretty good read but would have been better if the protagonist and world building were more complex and unique. "Gathering Blue" is a refreshing dystopian novel with an engrossing plot and well-rounded characters. Presenting a new kind of a dystopian society, it introduces the reader to a new kind of a society: it's not as progressive and sophisticated as those ones described in many dystopian books. In this book Lois Lowry strayed off the beaten path and it made the book even more interesting to read. It was artistically written - really, not only dealt the narration with artistic issues throughout the bo "Gathering Blue" is a refreshing dystopian novel with an engrossing plot and well-rounded characters. Presenting a new kind of a dystopian society, it introduces the reader to a new kind of a society: it's not as progressive and sophisticated as those ones described in many dystopian books. In this book Lois Lowry strayed off the beaten path and it made the book even more interesting to read. It was artistically written - really, not only dealt the narration with artistic issues throughout the book, but it itself had outstanding artistic power over the reader. Well, I must say this was pretty good. We get to experience another enclave in this mysterious world, created in the first book of the series; The Giver. Another settlement of higher council stiffs, lording over those less fortunate. When special gifts are displayed, those gifted are chosen (stolen) to serve; and everything and everyone around them is expendable. A few twists in the story, but the ending was not satisfactory. Why choose that route?? Why not peace?? Why?? I am not saying the ending was as heart-breaking as The Giver, but not sure if it will work. Not under the circumstances dealt.